How do you put a price on a beautiful photograph? A photograph takes a photographer’s time and a certain amount of materials to create. How well it turns out depends on the photographer’s technical skill, his creativity and his understanding of the jewelry industry. How much it cost, like with other services, depends on how long it takes to create the photograph. My prices are based on a time plus expenses approach and all “custom” projects are price this way. What you probably want to know is what a photo of your jewelry will look like and what will it cost? After photographing for 35 years, I have found several very useful jewelry and gemstone photographic set-ups. With these set-ups I know how much time and material it will take to create a beautiful and dynamic photograph. In the “Classic” Portfolio I feature several of these set-ups that produce a similar look. 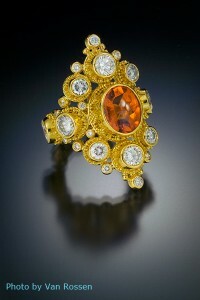 In this Portfolio I show range of different types of jewelry and how the piece of jewelry will photograph. On my Classic Jewelry Photo Service Price page I explain what it will cost, what special considerations to keep in mind, what options are available, and what types of advertising projects the photo is appropriate for.